Click the button above, or give us a bark at 610-430-7992 to get started with your postcard quote! Contractors: Roofers, painters, landscapers, general contractors, handyman, electricians and power washing companies increase their sales by leaving a yard sign in a customer’s yard for a few days…pretty soon every neighbor on the block will become a customer! Retail Sale: Clearance sale? Moving sale? Semi-Annual sale? 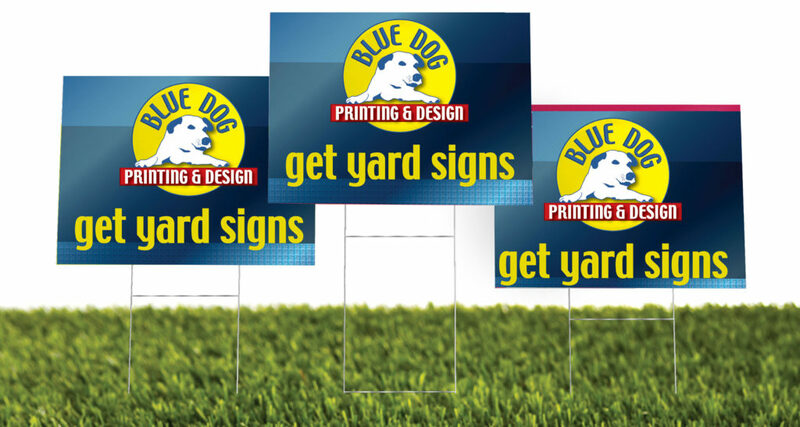 A few strategically placed yard signs around town will drive traffic to your store. Grand opening: Don’t be shy! 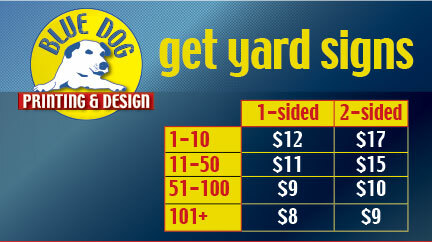 Pepper your yard signs all over the place to get the word out about your new business. Moving Soon or Just Moved: Place yard signs at both the old and new locations well in advance so that your customers know you will be/are at a new location. Outdoor Festivals: We recommend placing yard signs at major intersections about 2 weeks before your event. If it’s an event that happens every year, we can design your yard sign to have the dates easily changed so that you can reduce costs the following year with using patches on your existing yard signs. Political / Election Signs: Yes, they can be annoying, but everybody’s doing it! The more yard signs out there, the better your chances of getting the votes you need to win. Sports Leagues: Starting a new league? Need more people in your studio? Lawn signs are key in letting people know how to sign up. Charity Event: Are you hosting a 5k? Planning a Fun Run? Walking for a cause? Not only are yard signs useful to put out BEFORE the event to raise awareness, they are also key in directing people when they get to the event, as well as a great way to thank sponsors. Directions: Directional arrow lawn signs along the route to your business or event help reassure people that they’re going the right way!